My kit has a copyright date of 1968. 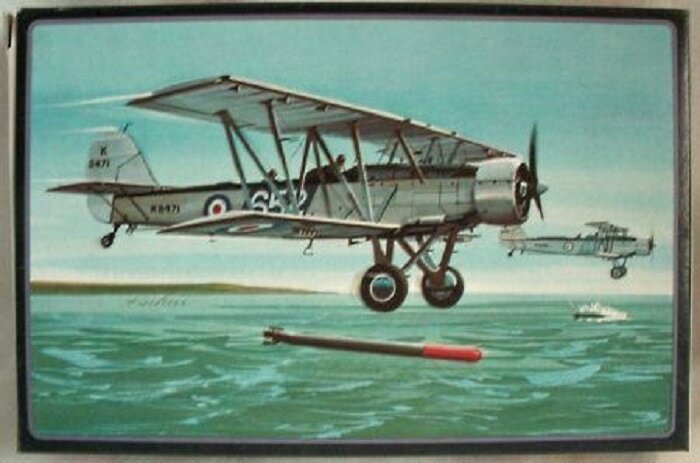 The Shark was the final model of a series of biplane torpedo bombers for the British Fleet Air Arm by Blackburn. The Shark went into service with No. 820 Squadron in May 1935 and 238 of the planes were eventually delivered to the F.A.A. The Shark was a sturdy, rugged bomber. One Shark actually survived a crash landing in the sea with the pilot "flying" the plane underwater to a "landing" on the ocean bottom. He then opened the cockpit and bobbed to the surface. The plane was recovered and flying again in less than a month. A 1,500 lb torpedo was carried beneath the all-metal fuselage. An equivalent load of bombs could be carried instead, if required. Protection was provided in the form of two Vickers .030 machine guns. Two floats could be attached in place of the wheels to permit expanded operations from water bases. The Shark was used in both land and sea versions by the F.A.A., and in 1936 six Shark II float-planes were sold to the Portuguese Navy. Twenty Shark II's powered by Bristol Pegasus engines, were built by Boeing in Canada in 1937 - 1938. The Shark had been retired from front line service by the beginning of World War II and was relegated to the target-tug and observation trainer role. Length: 35 ft. 2 ins. Powerplant: One Armstrong Siddeley Tiger VIc of 700 h.p. AMT Corp. was once the distributor of Frog kits in the USA. They were based in Troy, MI then. The kit comes in a shrink-wrapped end opening type box. 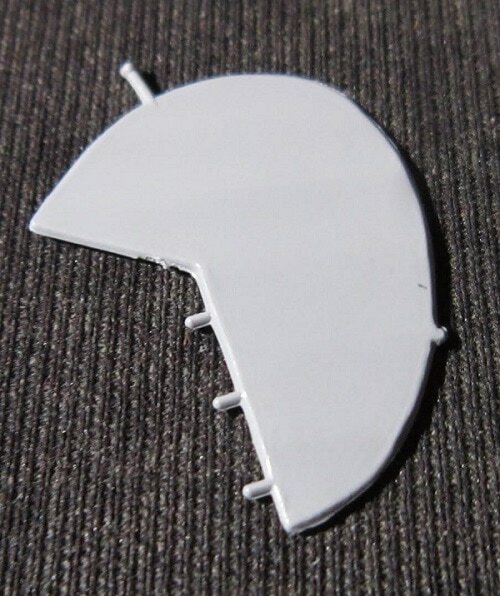 I am no fan of this type of box, because invariably parts or the decal sheet find their way past one of the end flaps to become lost forever. Give me a tray and lid type box any day of the week. The box art shows 2 Sharks dropping torpedos off shore at an unknown target that is not on the illustration. The Shark in the foreground has a black spine over grey sides and fuselage bottom. Wing tops and bottoms are a light grey. It has a dark blue fuselage band with a white 652 on it. 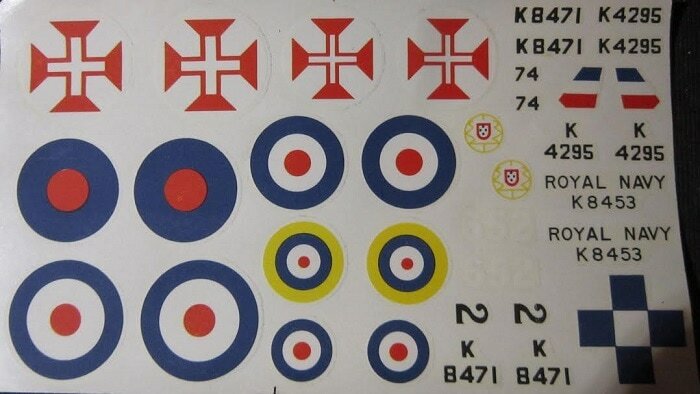 Then the roundel with a black serial no. K8471 behind it. The serial no. is again on the rudder sides with the letter k above the numerals. The second Shark in the background is in the same color scheme with a white 658 over its dark blue fuselage band and the black serial no. K8454. The bottom of the box serves as the marking and painting guide. Three color side profiles are shown. The first one is of a Portuguese Air Force Shark on pontoons. It is in the same color scheme as the cover art subjects. Its rudder is divided into green red and white vertical sections with a yellow crest symbol over it. Under the elevators is a black 74. A black no. 2 is on the sides of the nose. The second Shark is the box art subject (alread described above). The third Shark is in a wave pattern of dark green and dark earth over a yellow undercarrage. It has black ROYAL NAVY over K8453 behind the fuselage roundel. 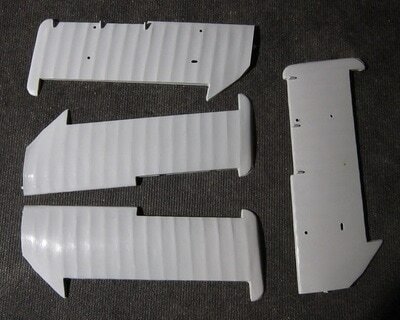 Kit was molded in Great Britain and packaged in the USA. AMT's street address in Troy, Mi is provided. 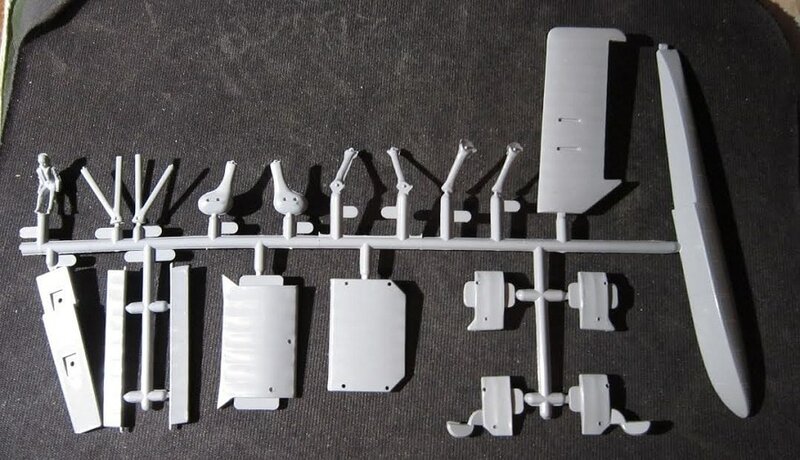 This kit holds 3 medium grey trees of parts, loose medium-grey fuselage and wing halves and clear tree in a sealed cello bag. 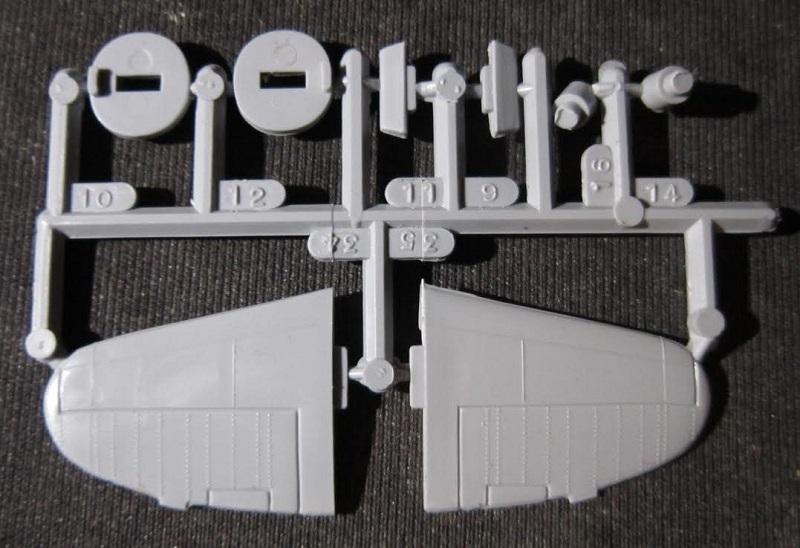 The decal sheet and instructions complete the kits contents. The instructions consist of a single sheet folded in the center to create 4 pages in 7" x 8 1/2" page format. Page 1 begins with a black and white illustration that is almost the box art. However, the two Sharks are flying in the oposite direction than shown on the box art and you can see a battleship in the distance that they are launching topedos at. Below this illustration is READ THIS BEFORE YOU BEGIN instructions. 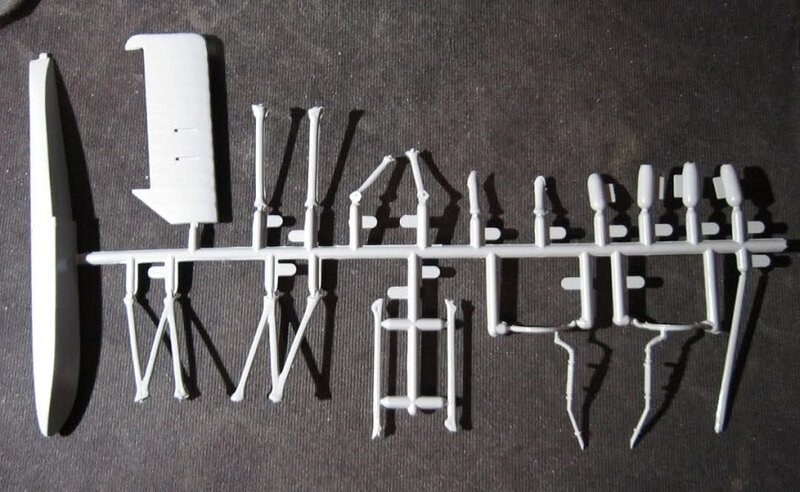 Pages 2 and 3 have a total of 9 assembly steps, with a lot of text to walk modelers through the builds. Step 9 has an A and a B part. For either pontoons or wheeled gear. Page 4 has the history of the shark. AMT Corp's P.O. Box address in Troy, Mi is at the bottom of the page and the instructions were printed in the USA. Instructions are folded in half again to fit the box. 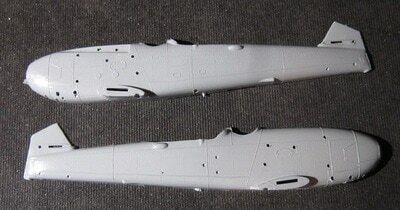 ​Next is the loose medium-grey fuselage and wing halves and rudder part. ​The clear tree holds 2 windshields. The trees are not alphabetized or illustrated in the instructions. They do however have part number tabs next to the parts on the trees. Panel lines are of the raised variety. 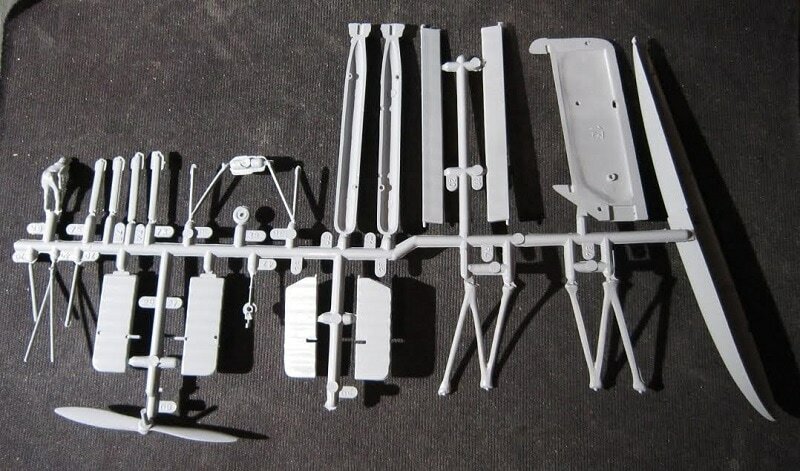 This kit has a large amount of parts and is very detailed. 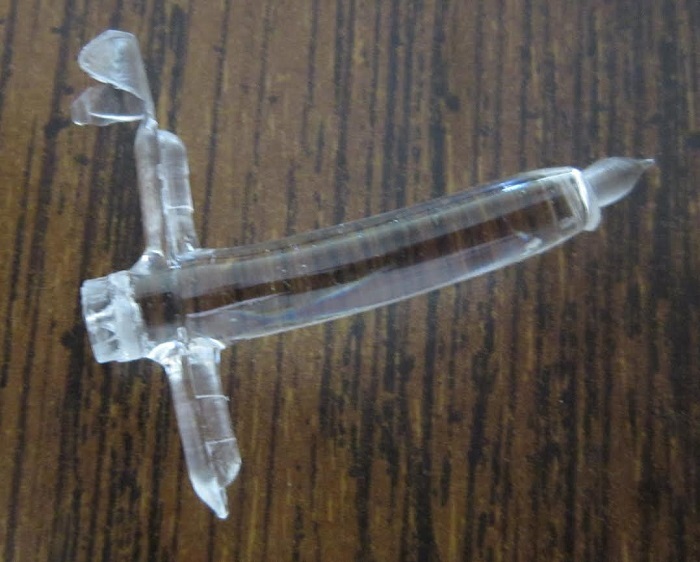 ​I purchased my kit back in the 60's at my local hobby shop that went out of business for a song.